AMD released the major yearly revision to its graphics driver suite back on 12th December. 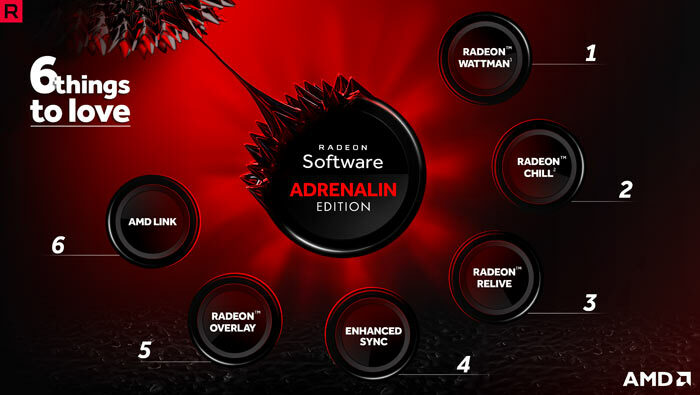 Heralding the arrival of AMD Radeon Software Adrenalin Edition, CEO Lisa Su wrote that it was the firm's biggest release ever, and would provide "a truly outstanding PC experience". Major features introduced included the AMD Link app, Radeon Overlay in game UI, and tweaks and feature boosts for other Radeon driver modules such as Radeon Chill and ReLive. If you are an avid up-to-dater, you may have already loaded up the new Adrenalin drivers. Other more cautious types might be waiting a few revisions for any big issues to be come to light and be fixed by AMD. If you have a PC games library featuring a bevy of DX9 titles perhaps such an issue has now become a hot topic on Reddit. There are numerous reports of various AAA DX9 games that are broken under the Adrenalin driver, not minor glitches but simply crashing upon startup. 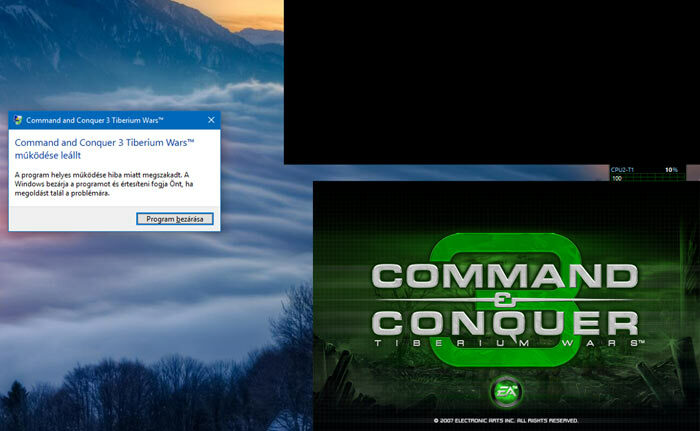 I am a big fan of the C&C games and own the latest Origin/Ultimate collection version (works with Win 10 but can't get past this driver issue). There are surely still a good number of players of these classic RTS games and the other games bullet pointed, even though they might be a decade old or more. Unfortunately the first and only response from AMD so far seems to be that the DX9 games affected are too old to be bothered about. In a response to concerns on the official AMD community message boards (discussing the C&C game problems), AMD technical support engineer Ray M wrote that "This title is from 2007, so we are unlikely to devote any valuable engineering resources to this issue, which is most likely caused by outdated API modules". As noted by the Reddit post, The Witcher Enhanced Edition has around 1900 players daily only on Steam, and "the C&C games combined have around 1500 players and this doesn't include Origin and GOG number". On the subject of games incompatibility there is a new and more detailed list now on Reddit which is being maintained, so games are added and taken away from it if they get compatibility fixes and/or workarounds found. As well as the above crashing upon startup games, the list includes; Skyrim, Tales of Berseria, Payday 2 (works, but unstable), Source engine games (unstable), and Spellforce 2. Director of AMD software strategy Terry Makedon has taken to Twitter to say that "I am seeing some stories pop up about AMD not supporting some old games. That is absolutely not true, we are identifying the bug and working on a fix asap. C&C, Witcher, BfME, etc will be working again." That's good news. 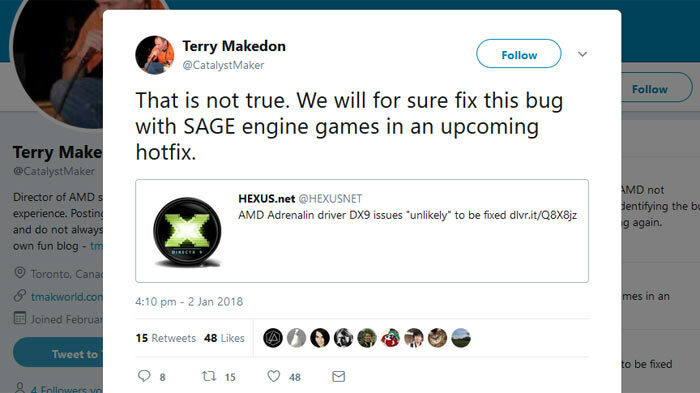 Another Tweet (as pictured below) makes particular reference to SAGE Engine games being fixed in an upcoming update to Adrenalin. Given that “response” from Ray M was on December 21st (that's what, 12 days ago?) and a much wider set of faulting DX9 games have now come to light, I rather suspect a more robust response will be coming from AMD. If an engineer sees one thread reporting a fault in one particular game/game series, they're not going to look into it. When it's a huge range of games across multiple developers, it's clearly a bigger issue. Emergency patch incoming in 3 … 2 … 1 …?